What Happens to Your Used Clothing? - Planet Aid, Inc. While inside the donation bin, your bag will stay dry and protected. Our bins are waterproof and securely locked. We monitor how much volume a particular bin receives and determine a pick-up schedule accordingly. Once in the truck, your clothes will make their way to one of our 12 warehouses, eventually arriving at the end of the day along with 5,000 additional pounds of clothing in the truck. As the truck is unloaded, we make sure no one donated something other than clothes or shoes. Our bins are posted with instructions that indicate we only accept clothes and shoes, but sometimes people donate other items too. That makes our job a little harder, but we try our best to find someone who will take non-clothing items. We sort clothing received at some of our facilities for the purpose of selling them in our Thrift Center. We also occasionally sort clothing for a local cause, like a winter coat clothing drive to benefit the homeless. However, most of the clothing we receive is loaded directly into our baling machine without sorting. The baling machine wraps the clothes in a protective cloth or plastic wrapper and straps them tightly together into a large package that weighs approximately 1,000 pounds. These bales make it easier to handle and ship the clothes from the warehouse to the final destination. The bales may remain in the warehouse for a few days, but generally no longer as the demand for the clothing is very high. Everyday we load the bales into trailers for domestic buyers or in shipping containers for overseas customers. These loads may be sold to a sorting house or "grader"—a business that will go through the individual items and sort them according to type and quality. A portion of that good-quality clothing goes to domestic thrift stores, but the large majority gets sold to overseas customers. This is a result of the high demand for used clothing in developing countries and the relatively low demand for used textiles in the U.S. The clothes that are sent overseas usually end up in developing countries where they can be resold on a micro level. This exchange creates jobs and provides a source of affordable clothing for those who don’t have much to spend. For example, the container your clothes get packed in may be sold to an importer in Guatemala. After some overland travel to a U.S. port, the container will be loaded onto a ship (bound perhaps to Puerto Barrios on the Gulf of Mexico). Once unloaded from the ship, the importer will unpack the container and sell individual bales that had been packed at Planet Aid. 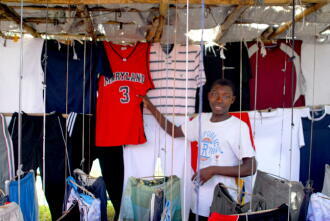 Sellers who operate used clothing stalls in a local outdoor market may buy a few bales each week. They will sort the items themselves and set the price for each, placing a higher price on quality name brands and lower prices on other items. Some better-off customers will buy the higher priced items and those with fewer means buy the relatively cheap items (often sold for pennies). In the end they will sell or give away everything. Why Not Just Give Away the Clothes? 1. There is simply not enough demand in the U.S. for all our castoffs. 2. Giving things away in developing countries can actually do more harm than good. 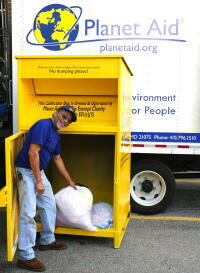 The average Americans throws away about 64 pounds of clothing a year—that’s about 191 T-shirts! Donating the clothes to developing countries would actually be detrimental to the local economies. Simply giving things away only puts a band-aid on the larger problem of poverty, and if clothing is free than the livelihoods of local retailers, tailors, and others in the textile industry are put in jeopardy. The resale market creates new jobs while offering a cheap source of desirable clothing. This is why, even when offered, most countries will not accept free items. Some criticize used clothing for undermining textile manufacturing in African countries. The truth is that the introduction of trade-liberalization and the opening of economies in the 1980s allowed both used clothing and cheap new imports, especially from Asian countries, to enter markets across the continent. It is well documented that new cheap Chinese textiles have had a huge effect on the African continent. It is a common misconception that all clothing donations are put back into local U.S. communities. Any major charity that collects textiles will end up selling the vast majority of the clothing it receives, usually using the proceeds to help fund their charitable initiatives. Planet Aid uses the money earned from the sale of used clothing to help fund sustainable development projects that help the poorest of the poor.